Subject:- Implementation of Revision of Pension of Pre 1.1.2016 Pensioners/Family Pensioners in pursuance to DP&PW OM 38/37/2016-P&PW (A) dated 12th May 2017 and Ministry of Finance (Deptt. of Expenditure) OM No. 1(13)/EV/2017 dated 23'rd May, 2017. 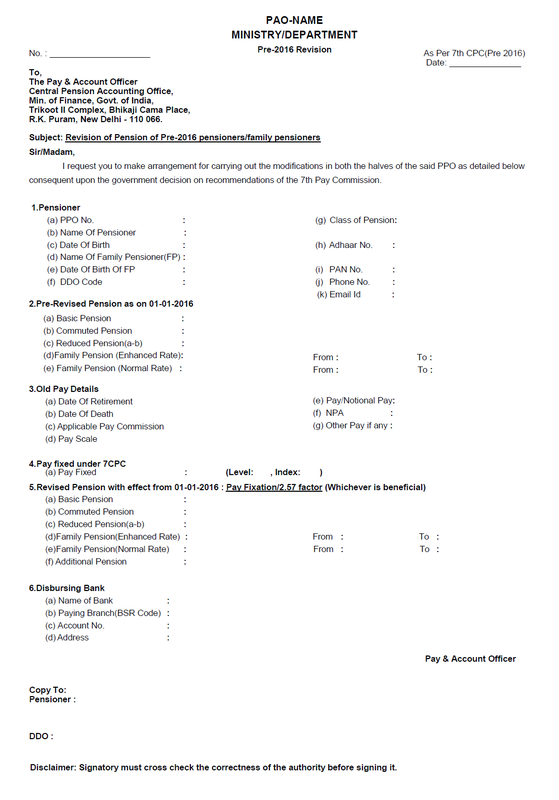 The format of revision of pension as mentioned under Para 4 (iii) of OM No. CPAO/IT&Tech/Revision (7th CPC)/ 19 (Vol-III)/2016-17/37 dated-25.05.2017 on the subject cited above and annexed thereto for revision of pension under 7th CPC pre-2016 cases has been slightly modified as per annexure. 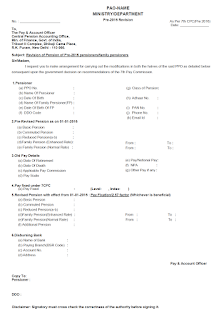 The enclosed format shall be used both for the electronic revision of pension through e-revision utility of CPAO and in case of manual revision for sending the paper based revision authorities by PAOs to CPAO. As per the prevailing conditions, Govt of India sanctioning DA once in 6 months i.e. 1st Jan. & 1st July. Based on consumer price index, due to raise in the inflation for the period of once in 6 months i.e. 1st Jan. to 30th June & 1st July to 31st December respectively DA being sanctioned to those Central Govt. employees and as DR to the Central Govt. Pensioners. This DA/DR is cumulatively added every month, for administrative convenience, it was being sanctioned once in 6 months. For those Central Govt. employees who were having DOB 1st of any month are being forcibly superannuated on the last working day of the preceding month. Particularly, those who were having DOB 1st Jan. & 1st July, though they have completed 6months, sanctioned DA was not considered for calculating Retirements viz. Gratuity & Leave encashment purpose. whether a retired Government servant is entitled for revised rate of D.A., which comes into force after such Government servant retires from service on attaining the age of superannuation. As per the Honble. CAT judgement, DA was allowed for calculation of retirement benefits; to those retired on 30th June (DA was sanctioned next to their retirement date. The said case was appealed in Honble. High Court of A.P. the WP was dismissed, further, Govt. of India appealed as SLP in Honble. Suprem Court of India, there also it was dismissed. Orders were issued for implementation of DA to the Central Govt. Servants, who were working in Accountant General Office, Hyderabad. Since, it is a common issue, individuals who were worked in various Departments of Central Govt. should not insisted that who ever will proceed litigation, it will be implemented. It shall be implemented across the board to all the employees to save the money & man power of Govt. of India to avoid litigations. d) Through Lr No.PAG(G&SSA)/Legal Cell/RTI/F.No.118/2016-17/D.No.45 dt.02/11/2016 intimated that Supreme Court order was implemented for payment of Retirement Gratuity & cash equivalent to leave salary. According to Rule 83(1) of the Pension Rules, Pension becomes payable from the date on which Government servant ceases to be borne on the establishment (emphasis given). A Government servant continues to be borne on the establishment till midnight of the date of superannuation. The decision of the Hyderabad Bench of this Tribunal in T. Krishna Murthy 's case (supra) cannot be brushed aside out by the learned Counsel for the respondents. Retirement may be by voluntary or on superannuation. The principles for payment of pension will not vary on the basis of these distinctions. According to us, "afternoon of 31st March or forenoon of 1st of April means one and the same thing and on this balance also we see no reason to hold that the said case is not applicable to the present cases. In short, we are of the view that in the present cases the effective date of retirement would be 01.04.1995 and not 31.03.1995. The decision of the Supreme Court in UOI v. P.N. Menon and Ors. CA No. 417 of 1987 and several other cases relied on by the learned Counsel for the respondents in support of his contention need no attention, because they are not exactly or remotedly on the point under consideration. The OM dated 14.7.1995 is not challenged in these cases and, therefore, the argument tried to be made with reference to cut off date or financial, implications in these cases, is misplaced. A Government servant completing the age of superannuation on 31.03.1995 and relinquishing charge of his office in the afternoon of that day is deemed to have effectively a retired from service with effect from 01.04.1995." As per law laid down by the Full Bench supra we hold that the applicant has effectively retired from service with effect from 1.4.95. In view of the fact that the applicant is deemed to have retired on 1.4.95, the benefit of OM dated 14.7.95 (supra) would be made applicable to him for all purposes. We hold so accordingly. In the result we allow this OA and direct the respondents to treat the applicant to have retired with effect from 1.4.95 and pay him the benefits as enumerated in the OM dated 14.7.95. This exercise must be carried out within a period of three months from the date of receipt of a copy of this order. No costs. 3. SLP was not filed in the Supreme Court of India. 4. Vide Lr No.18(1701)1602/94-KVS(HQ)/P&I/3175-78 dated 10/03/2017, the said letter received thru RTI stating that revised Gratuity was implemented. Similarly in the case of Govt Servants who were having DOB 01/01/1956 and forced to retire on 31st Dec. 2015, since Gratuity amount was enhanced from Rs.10 lacks to Rs.20 lacks, and orders effective from 01/01/2016, the same shall be made applicable in our case also like one Mrs. Kamal Gupta of KVS. 1. At the age of 61 years commutation factor is 8.194. 2. An individual Govt Servant having DOB 2nd of the month onwards, the next birthday will fall on from 2nd onwards. 3. An individual Govt Servant having DOB 1st, his next birthday will be only on 1st. 4. As per FR 56(a), if the individual Govt Servant having DOB 1st, he is forced to retire on last working day of preceding month. Doctors retirement extension wef 31st May, 2016. Those who were having DOB 1st Jan. 1956 and are forced to retire on 31st Dec. 2015. Since, 7th CPC made applicable from 01/01/2016, Govt. Servants who were retired on 31st Dec.2015 and 31st Dec. is the working day, Pay & Allowances are drawn for that day also, retirement is effected after midnight 12 o’clock only. However, now Govt. considered to revise the Pension at par with those who are in service as on 01/01/2016. As such there is vast difference in retirement benefits nearly Rs.15 lacs. Hence, Govt. shall consider to get eligibility for revised Gratuity, encashment of Leave & Commutation value as per 7th CPC for those Govt. Servants having DOB 01/01/1956 and retired on 31/12/2015. Send your article separately on email or through comment box, will happy to publish here. will u pl provide email address for sending the article. Sir, Is it now an established position that even though the service comes to an end on 31/3/2018 (DOB-1/4/1958)on completion of 60 yrs, one is held retired on 1/4/2018? Implementation of Revision of Pension of Pre 1.1.2016 Pensioners/Family Pensioners in pursuance to DP&PW OM 38/37/2016-P&PW (A) dated 12th May 2017 and Ministry of Finance (Deptt. of Expenditure) OM No. 1(13)/EV/2017 dated 23'rd May, 2017.